The aviation industry has had the technology for years that can prevent midair collisions as well as reducing the number of casualties caused by midair collisions such as the one that occurred on Saturday, August 8, 2009, when a Piper Lance aircraft collided in midair into the rear of a sightseeing Eurocopter helicopter over the Hudson River killing all nine passengers. Such technologies would include onboard cockpit collision avoidance system and emergency parachute deployment systems. BRS Aerospace (commonly known as BRS or Ballistic Recovery Systems) is a company that began research into a parachute deployment system in which a parachute could be deployed form an aircraft, bringing the occupants safely to earth, in the event the aircraft was unable to land under its own power or configuration. In 1993, after seven years of research and spending $1.5 million, BRS was granted the first Federal Aviation Administration (FAA) approval to install a parachute on a certified aircraft… the Cessna 150. Today, many types of aircraft are equipped with parachute deployment systems. Some aircraft manufactures provide the system as standard equipment and others are installed at the request of aircraft owners as an after-market add on. The parachute system is designed to protect occupants in the event of an emergency by slowly lowering the aircraft to the ground after deployment. Generally speaking, the parachute deployment system can be operated at the aircraft’s service ceiling to a minimum of 300 feet above ground. In the event of an in flight emergency, the pilot would activate the parachute deployment system by pulling on a red handle situated inside the cockpit. When the system is manually activated, a solid fuel rocket is shot out of a box mounted on or in the aircraft that ballistically jettisons the entire parachute package well clear of the fuselage, wings, and tail. Within seconds, the parachute canopy is fully opened, controlling the aircraft rate of descent. BRS began installing parachute deployment system on the Cessna 150 and 152 aircraft. This was a giant step forward in aviation safety. 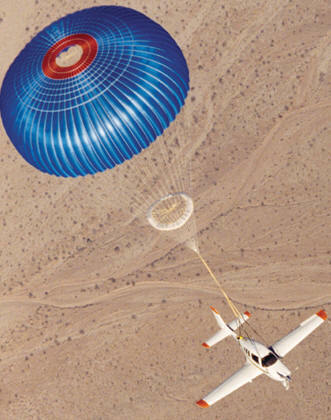 Cirrus Design Corporation (the world’s leading manufacturer of single-engine, piston driven, 4-seat aircraft) installs the BRS parachute deployment system, known as the Cirrus Airframe Parachute System (CAPS) which comes as standard equipment on every Cirrus aircraft. Current parachute deployment system technologies might have saved the lives of the occupants on the Piper Lance aircraft that was involved in the midair over the Hudson River. However, due to research and development costs, the aviation industry has not met the milestone for parachute deployment systems on helicopters as of yet. BRS parachute deployment systems have been credited with saving the lives of at least 238 pilots and passengers since installations began in the early 80’s. The BRS parachute system is specifically credited with saving the lives of two pilots involved in two separate midair collisions in August 1992 and in September 2007, respectively.